The switch of this "away" match to Lewes suited the home side, as they completed the double over local rivals Hellingly to secure promotion as Sussex League 1 Champions to London League 3 next season. However, unlike the first encounter earlier in the season - when Lewes rattled up a 114 - 0 victory - the visitors' much-strengthened side put up a greater fight this time round, restricting the home side's win to exactly half of their first defeat. The opening try was scored by flanker Nathan Lowen after only 7 minutes, outside-centre Nick Sharp kicking over the conversion to see Lewes take an early 7 - 0 lead. Seven minutes later, a flowing Lewes attack culminated with full-back Dan Wade coming into the line for a fine try near the posts, Sharp adding the extras to extend the lead to 14 - 0. This was stretched to 19 - 0 just before the half-time whistle, Player-Coach Mike Stubbs scoring his team's third, but unconverted, try - an historic event as it turned out, as it meant that Lewes had now scored exactly 1,000 points so far this season, something they had not done since the Club's hey-days in the 1970's. The second half saw Lewes take control, scoring almost straight from the the-restart with Stubb's second - and his Club's bonus-point fourth - try out right after another flowing attack, Sharp slotting over the extras to extend the advantage to 26 - 0.This was followed in quick succession by further tries from skipper James Halpin, Henry Shiell , and 2 from George Dean, Sharp,adding two more conversions, to stretch away at 50 - 0. Just before the end of this entertaining match, witnessed by a large crowd, Lewes rounded off another victory with a final try from replacement back Will Tobin, converted by Sharp, to make the final score 57 - 0. After the post-match ceremonies, Stubbs remarked: "We were very rusty today and wasted a number of chances. But we're really looking forward to the challenge at Seaford on Saturday for our final League match of the season".(k.o. 3.00pm). Before the match, Club stalwart and Match Sponsor Dave Harries and some 35 of his "Annual Ramblers" made the long hike over the Downs before attending the pre-match Lunch which was a happy - if not rowdy! - re-union for many former Lewes Players, and which boosted the attendance and home support during the match itself. Lewes 2nd's - whose League match was also switched to the Stanley Turner Ground - made it a successful afternoon for the Club, beating Hellingly 2nd's by 14 - 10 with tries from Josh Leigh, converted by Pat Rourke, and Josh Farr, which he also converted. (the venue for the 2nd's final League match of the season on Saturday against Seaford 2nd's is yet to be decided). 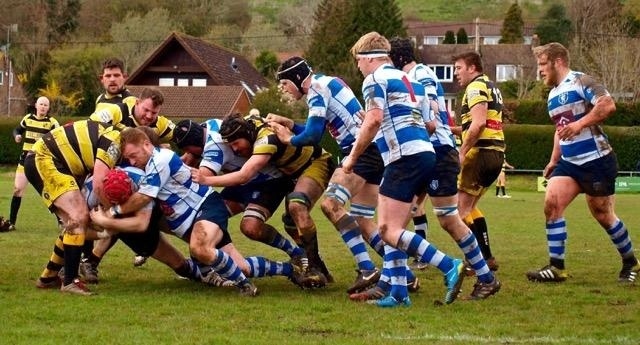 After next Saturday's fixtures against Seaford, Lewes players and supporters will be assembling back at the Clubhouse for their end -of-season celebrations - including of course the promotion of the 1st XV - at which the Annual Awards ceremony will also to be held.